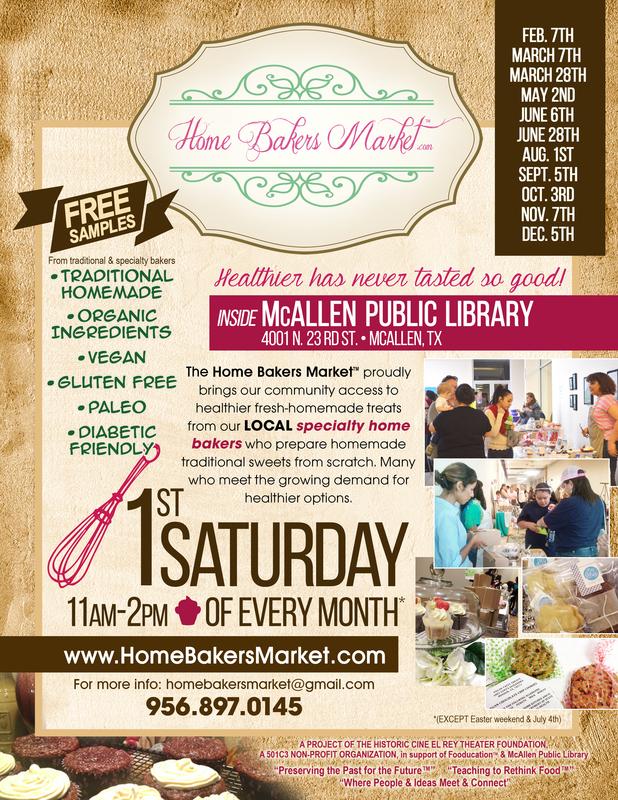 Home Bakers Market﻿™﻿ will be held 1st Saturday of the Month INSIDE the McAllen Public Library from 11am-2pm. Our mission is to provide healthier baked good options made from scratch from our local specialty Home Bakers many who use organic ingredients and meet the growing demand for paleo, gluten/grain free, vegan and diabetic friendly goodies. LET US BAKE FOR YOU !!! BE SWEET and please SUPPORT our LOCAL HOME BAKERS who are BAKEKING A HEALTHY DIFFERENCE FOR OR COMMUNITY!!! *If you are a Home Baker and would like to apply to participate, please go to the website www.HomeBakersMarket.com and fill out an application or contact us at 956-897-0145 ASAP as space is limited. Home Bakers Market™ is a project of The Historic Cine El Rey Theatre Foundation who's mission is "preserving the past for the future", Cine El Rey"because we care more than just to entertain you" & created by The Fooducator® who teaches us to "Rethink Food", supported by Major Health Foods, La Salud Del Valle, McAllen Culinary School and many volunteers who want to create access to healthier baked goods and support local Home Bakers. 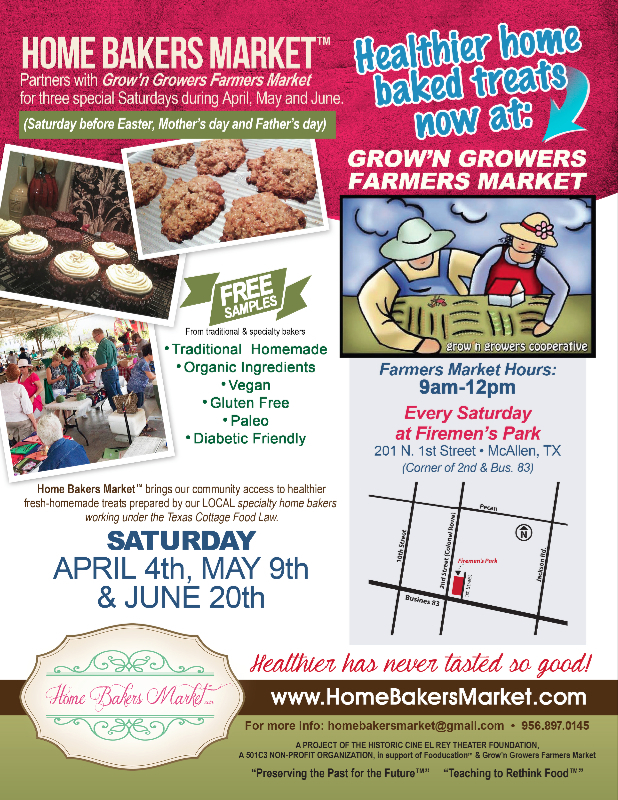 Home Bakers Market™ partners with Grow'n Growers Farmers Market for three special Saturdays in April, May & June of 2015 to make healthier options available to our community for the weekends of Easter, Mother's Day & Fathers Day. Grow'n Growers Farmers Market is EVERY Saturday from 9am-12 noon at Fireman's Park in McAllen located at 210 N. 1st Street on the corner of 2nd Street and Business 83. The Home Bakers will have FREE SAMPLES of traditional homemade goodies along with some that are made from organic ingredients and others that are vegan, gluten free, paleo or diabetic friendly. Would you like to start your own Home Bakery Business? Come sign up for the "How to Start A Home Bakery" Introductory Class! We'll teach you how to become part of the upcoming Home Bakers Market™ creating access to healthier homemade sweets. Download flyer below for details on business coaching session dates and location! © 2014 All rights reserved The Historic Cine El Rey Theatre Foundation a non profit 501 (c) 3 organization whose mission is "Preserving the past for the future"